Pro Evolution Soccer is back for 2009! The terms "PES" and "Winning Eleven" have always been synonymous with realism and superior gameplay, but this year PES will further narrow the gap between the game, and the real thing! New stadiums, players motions and gameplay modes will bolster a game already focused on providing an exciting soccer experience. 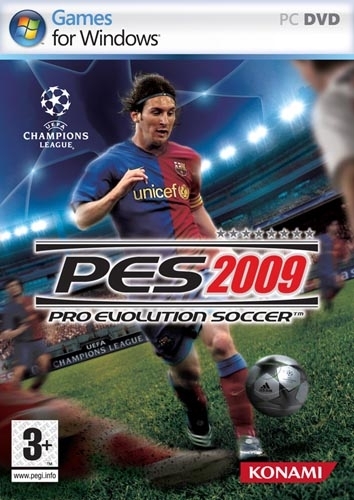 In 2009, Pro Evolution will once again push the limits of soccer gaming. If it were any more real, you'd be on the field! Exclusive UEFA Champions League Mode utilizing all the elements and attributes of the competition. With smarter AI system your team mates will be constantly seeking out open space, taking intelligent lines toward the goal and on defense and also actively calling for the ball! Improvements to the fan-favorite Master League Mode - Play as one player just like in real life mastering your own ball handling and your off the ball support!